This week was a lot less productive than I’d hoped, even factoring in Monday being a holiday and most of Tuesday’s schedule getting canceled out by snow and sub-freezing temperatures. I’m going to be paying for that this week. This was set to be last week’s column until the net-neutrality ruling upended my schedule. Considering that nobody’s rushing out to buy UHD sets before the Super Bowl, I don’t think the delay hurt this post too much. I returned to Gene Steinberg’s podcast to talk about my new role at Yahoo Tech, net neutrality, the Mac’s 30th birthday and more. 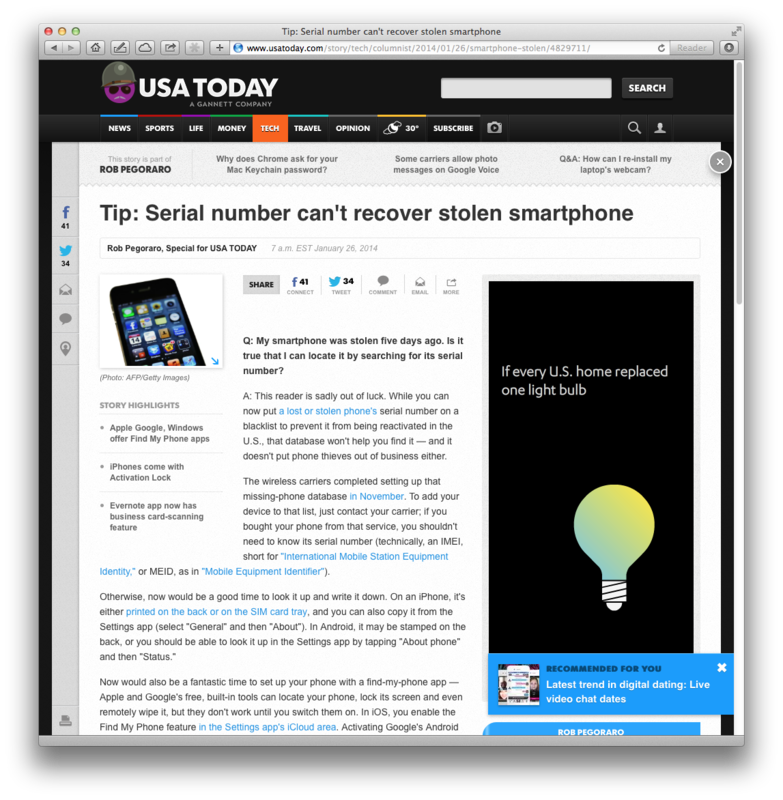 Barely a year has elapsed since I’d last covered find-my-phone apps in my USAT column, but two major changes have come around since that piece: Google offering its own, free phone-finder app for Android, and increased attention to the lack of a persistent kill-switch feature for smartphones beyond iOS 7’s capability and Absolute Software’s aftermarket Lojack app for some Samsung Android devices. Besides, the reader asked for help nicely. On Sulia, I noted my old Washington Post colleague Ezra Klein’s departure from the paper, voiced some anger about a Kafkaesque overreaction by law enforcement and the MPAA to somebody wearing Google Glass to a movie, griped about bad USB-port placement and the stubborn survival of obsolete music formats in cars shown off at the Washington Auto Show (yes, you’ve read those two rants before), and reported about my experience using Absolute’s software to wipe and lock a Galaxy Note 3. This entry was posted in Weekly output and tagged 4K, Android Device Manager, business cards, ces, Evernote, find my phone, HDTV, IMEI, Mac 30th anniversary, MEID, net neutrality, Retina display, stolen phone, Tech Night Owl, UHD by robpegoraro. Bookmark the permalink. this page Weekly output: 4K UHD TV, Tech Night Owl, stolen phones | Rob Pegoraro.